With a stay at Khaosan World Namba in Osaka (Namba), you'll be within a 10-minute drive of Osaka Science Museum and Shinsaibashi Shopping Arcade. Featured amenities include luggage storage, laundry facilities, and a safe deposit box at the front desk. With a stay at this apartment in Kyoto (Central Kyoto), you'll be within a 10-minute drive of Sanjusangendo Temple and Gion Corner. With a stay at Hotel Route-Inn Mojikou in Kitakyushu, you'll be within a 5-minute walk of Ryukyu Islands and Moji Port. Limited parking is available onsite. 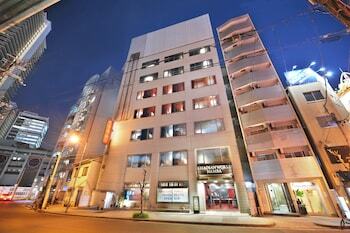 With a stay at this hostel in Gero, you'll be a 1-minute walk from Doai Onsen and 5 minutes by foot from Gero Onsen. Featured amenities include luggage storage and laundry facilities. Located in Nakafurano, this cottage is within a 10-minute drive of Museum of Kitano Kunikara and Lavender East. Free self parking is available onsite. Located in Kyoto (Central Kyoto), this vacation home is within a 10-minute drive of Nijo Castle and Kyoto Imperial Palace.